It might be possible to do this manually on the S-CPU, but it would take a huge chunk of each frame*. It might work, as long as not much is happening (no AI racers?). But if a special chip, such as the SA-1, were being used, it seems like it would be possible to build a 4 KB DMA-ready chunk of map quite rapidly, in maybe 6% of a frame or so. This number seems to be similar on the SA-1 and the Super FX, if I've understood things correctly. The SA-1 can use repeated DMA from ROM to BW-RAM to build the map out of 64-byte strips, and the Super FX should be able to use cached code to pipeline the data through the ROM and RAM buffers so as to saturate both. 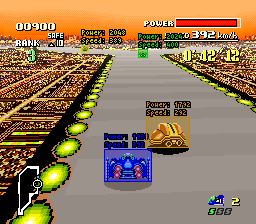 Adding an SA-1 or Super FX seems like overkill for just hacking a split-screen two-player mode into F-Zero (which would probably be a substantial task on its own). It would probably be more appropriate in the context of a whole new game designed to use the full power of the expansion chip (which would be a monumental task, not to mention the copyright issue - but boy do I have ideas...). EDIT: I may have made an unwarranted assumption. This post and the next one should be taken with a grain of salt, if you can make sense of them at all. Last edited by 93143 on Wed Feb 24, 2016 2:06 am, edited 1 time in total. 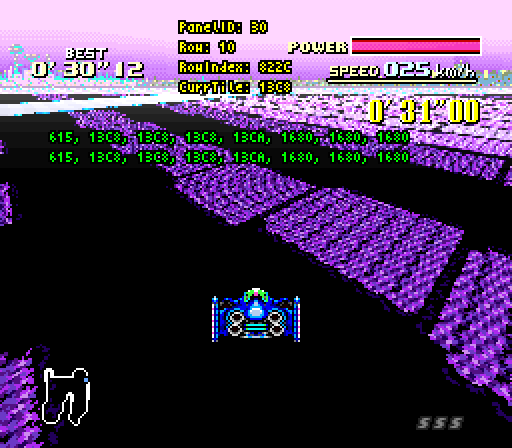 The problem is that while F-Zero as it stands can simply construct and DMA a couple of rows/columns of the tilemap on demand, switching out 4 KB of map data each frame is considerably more labour-intensive. I'm attempting to brainstorm methods of building a chunk of data in RAM (WRAM or BWRAM or whatever) that can simply be DMAed to VRAM in one shot during VBlank. Actually, the numbers I've given are (a) probably wrong, and (b) for pulling from a giant uncompressed map in ROM, which is not how F-Zero works. I imagine a hack could work that way in principle, with a massive ROM expansion, but even then you're pulling non-contiguous 64-byte pieces and concatenating them, which is a lot of DMA transfers, meaning a lot of overhead. It would require some extra code for DMAing across bank boundaries (indexing works, but DMA wraps) that would increase the overhead a little beyond what I've suggested above. I still think it could probably be forced to work on a stock SNES, but an enhancement chip would help quite a bit. "During the emulation process, many patches to the ROM are made to turn various aspects of the the gameplay into multiplayer, while several memory hooks watch the RAM for certain signals that indicate different game states etc." You can read more about that exact process as this page (http://fzerovs.blogspot.com/2008/07/what-is-fzvs.html) at the FZVS blog (long abandoned). Bad news is the link to the source code download no longer works and I can't find a working link anywhere across the internet. None of the previous links work in archive.org either. Basically this source code is lost. The only other thing I've thought of trying is sending emails to the commenters on the source code page who did indeed download it and see if they still have it and can upload it somewhere like github or something (however, a lot of them, don't look active anymore). I also found a blog that linked to the source code, but that person hasn't wrote a article on the blog in years so who knows if they would respond to an email. "It wouldn't require a lot of code modification, although I'd need to do some things differently. I'd need to inject some code into the main loop to do what the emulator essentially does (updating the RAM etc). But I also patch the ROM in realtime, so in these cases I'd probably need to substitute it with different approach. All possible of course." "Also, with the joyport link cable, you wouldn't have to worry about latency issues. The SNES can read the values on IO,D0,D1. Clk is an output from the SNES that is pulsed when reading certain SNES hardware registers. The SNES can output values on IO and latch. Unfortunately, all the SNES "extender" cables I've found on Ebay actually only work for controllers (not the guns, etc.). That is because they are cheap and only pass through Gnd,Vcc, Clk,latch,D0. The problem with this is there is no easy way to know when the next bit is ready. Carefully written code can make this work though. Or, you could even make it asymmetric so the snes can detect which side it is, and use this to automatically select one machine as "player 1". You can either use careful code and send twice as much now, or use one of the data lines to indicate when the next bit is ready (easier to code and debug). If the first way works, that is clearly preferable, as it would be the easiest and cheapest for anyone to make. Also, the extenders are usually 6 foot, so after splicing two to make the cable it would be 12 foot ... which would be a decent distance for setting up the two systems. You could instead make the SNES connectors attach to phone line connectors (most phone lines have at least 4 wires internally)... then you could string a long phone line to set the distance however you want." Unfortunately he joined over 7 years ago and only posted three times. Doesn't even show when his last visit was since it was so long ago. 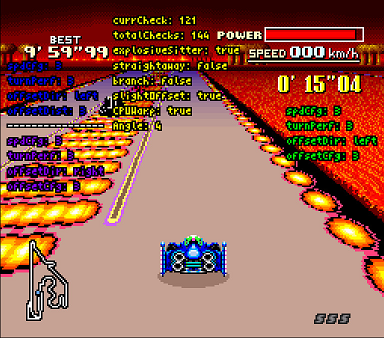 I was thinking that if you could get 8 KB of map data decompressed and concatenated in one frame without crowding out the rest of the game engine, you could do a 4-player split-screen F-Zero on SNES. Unfortunately, the task is probably utterly impossible on the S-CPU, not least because you'd need a big ugly H-IRQ to handle the Mode 7 matrix split. This implies the SA-1, or possibly the Super FX, and it happens that both of those chips draw too much current to be used together with a multitap. Looks good, too bad you're saying it can't work. If you need any info definitely check out CatadorDeLatas's F-zero Notes Document: https://docs.google.com/document/d/1yhZrwn7Mq8WL83YWzSFIKB4mHWEC84TXpvRU2_Pb7lE/edit?usp=sharing. He's done a lot of work to map out pretty much the whole game. Tons of RAM and ROM addresses with explanations. I'd say right now CatadorDeLatas knows the inner workings of SNES F-Zero more than anyone else besides the original developers. He's made patches that make the CPU cars explode if they fall off the track and even gave them health like the player has (!). "I tried modifying EBMusEd (Earthbound Music Editor) to work but I couldn't actually do it. 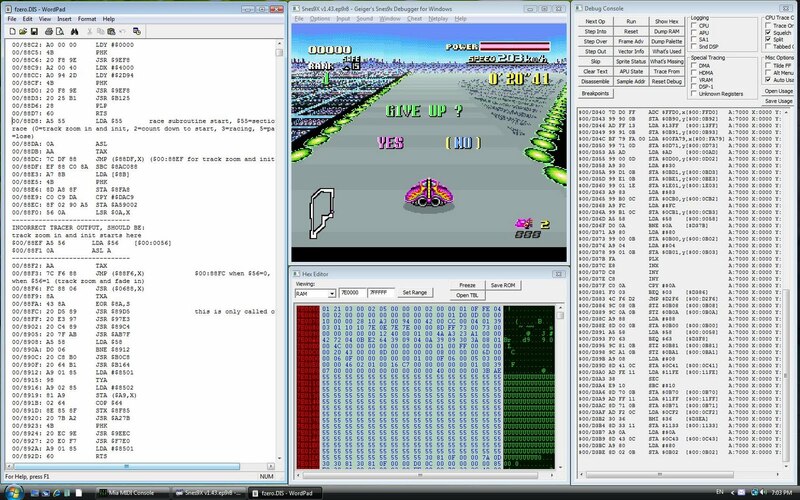 Mainly because EB is HiRom and FZ is LoRom, this screws SNES address to PC address conversion." Yup, I fooled around with this game back in 2012. All I did with F-Zero was to give it the ability to pick any of the course music to race with (which for me acts as a bank modifier). nensondubois produced the sub-tune portion of the music modifier, and what I produced only works at the start of a race if memory serves me right. The music modifier by nensondubois supports 01-08, wrapping around at 08. The bank modifier, which only affects sub-tune tune 06, supports 00-09. By default, bank 07 is the one that's loaded. The game crashes after bank 09. Looks good, too bad you're saying it can't work. I believe the fake screenshot I posted is possible on a real SNES, but it would glitch out the moment anybody tried to steer... I could try it, I suppose, but given what happened when I tried switching from Mode 1 to Mode 7 mid-scanline, I don't expect a happy result. And the power supply constraint means there's not much point in trying anyway. If you need any info definitely check out CatadorDeLatas's F-zero Notes Document: https://docs.google.com/document/d/1yhZrwn7Mq8WL83YWzSFIKB4mHWEC84TXpvRU2_Pb7lE/edit?usp=sharing.